Gavop studied the top 10 mortgage lenders of Chicago, Illinois, and the number of refinance loans originated by each in 2017 for 1-4 family houses. JP Morgan Chase Bank, National Association, has emerged as the top lender, with 1,861 loans originated in 2017. Guaranteed Rate Inclusive is second on the list and Quickens Loans Inclusive at number three, with 1,546 and 1,210 loan originations respectively,. For this analysis Gavop sourced data from the latest Home Mortgage Disclosure Act (HMDA). In 2017, the total number of refinance loans originated in Chicago was 16,454. This is a 69.03% decline from the 27,813 originations in 2016. In the state of Illinois 91,734 loans originated in 2017 as opposed to 151,073 originations in 2016, showing a decrease of 64.69%. The Gavop study also compared the year wise loan originations for each bank and found that for JP Morgan, the total number of loans originated in 2017 (1,861) was 55.08% lesser than that in 2015 (2,886). Guaranteed Rate Inclusive bank saw its total number of loan originations decrease by 75.03% from 2,706 in 2015 to 1,546 in 2017. However, between 2015 and 2016, the bank’s loan originations increased by almost 30% (806 originations). Quicken Loans Bank, ranked number three, showed a 3.42% increase from 1,170 originations in 2015 to 1,210 in 2017. Among the top 10 lenders in Chicago, the highest growth rate in the last three years observed has been registered by Loandepot.com, at 49.08%. The second highest at 22.13% is Nationstar Mortgage. Apart from these two and Quicken Loans Bank, all other refinance mortgage lenders have reported a negative growth rate in the last 3 years. 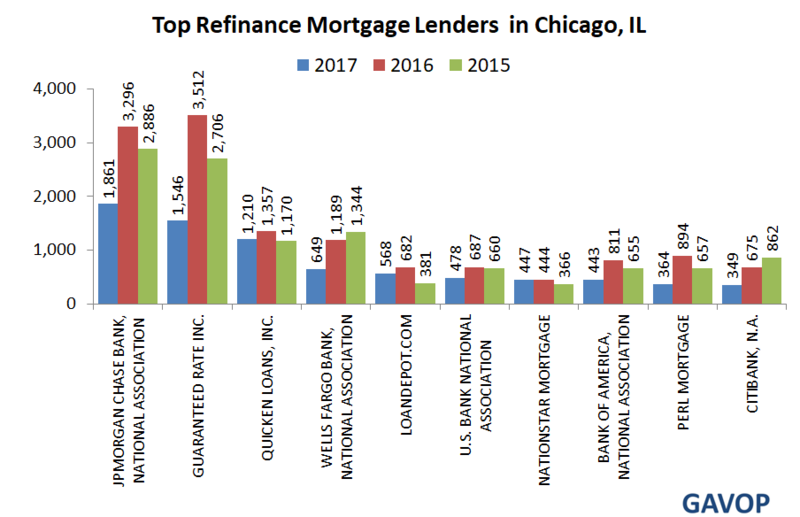 The following graph compares the top 10 lenders in terms of their refinance mortgage originations in Chicago for the last three years. The research also examined the compound annual growth rates (CAGRs) of the top 10 companies in the last five years. Only Loandepot.com reports a positive CAGR, at 39.6%. All of the other nine banks have a negative CAGR. The lowest is reported by Citibank, National Association, at -37.9%. It is followed by Wells Fargo Bank, National Association at -26.3%. The table below shows the top 10 Chicago mortgage lenders in order of their loan originations for refinance in 2017. For more details & data on Chicago, Illinois Mortgage Lenders, click on this link.